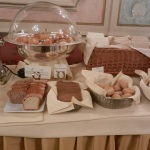 Breakfast at the Baglioni Hotel Luna in Venice is definitely an unforgettable event. 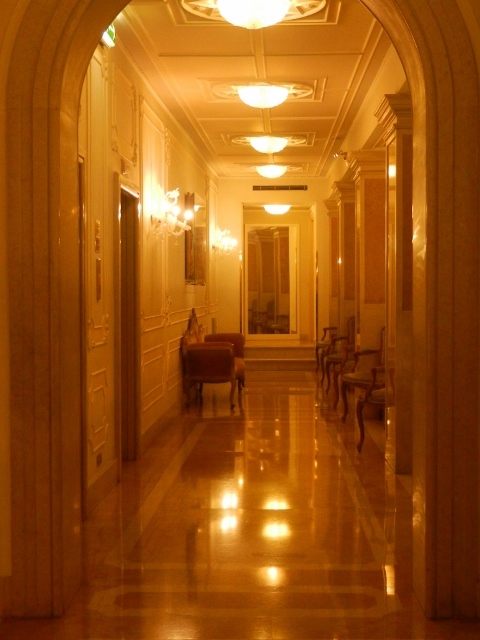 Although I anticipated something special as I walked down the glamorous corridor adorned in rich marble and Murano chandeliers, I wasn’t quite prepared as I approached this magnificent room. 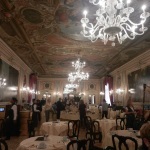 The Marco Polo Salone is the most elegant breakfast room I have ever seen. 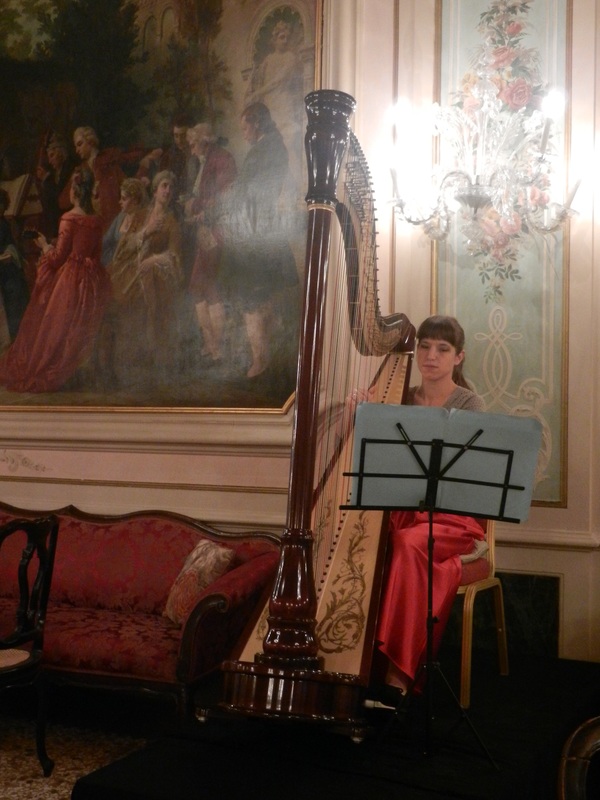 Before reaching the entrance doors I heard the soft sounds of a harp playing, and once inside I saw that the gifted harpist was a young woman clad in a long, red, evening skirt. I had to stop and look around as I entered this immense ballroom. 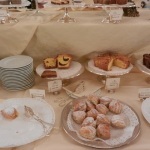 It reminded me of a scene from the era of Louis XIV with its rich décor. 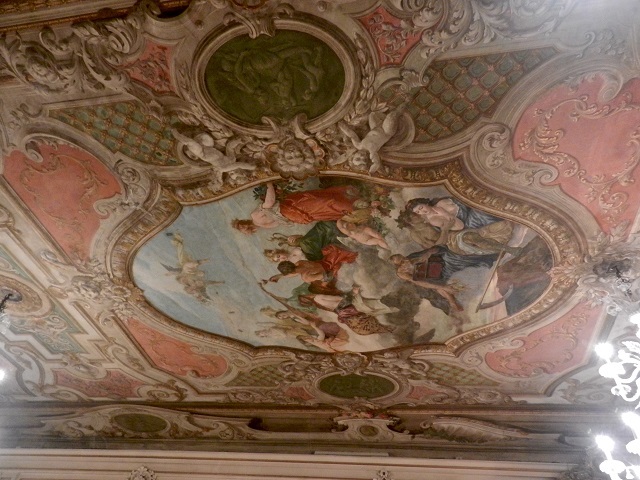 Every inch of the high ceiling was painted with original frescoes by students of the renowned Venetian painter, Giambattista Tiepolo. 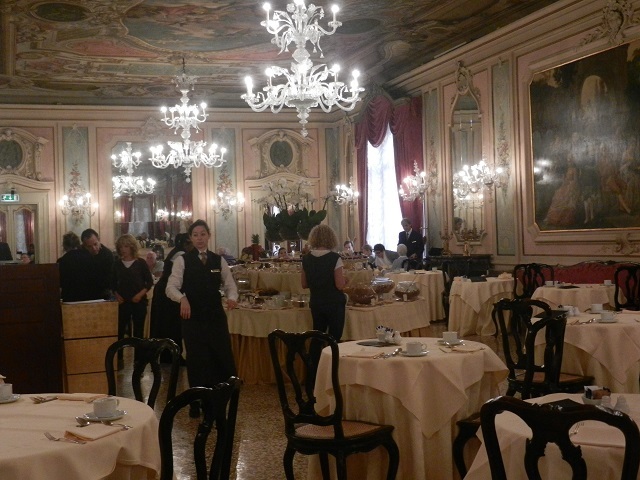 No less than sixteen Murano glass chandeliers adorned the walls in addition to the three huge double chandeliers that hung from the ceiling. Mirrors, artworks, paintings, and elaborate magenta-colored window treatments complemented the soft colors of cream and light turquoise on the walls, defining this elegant room. 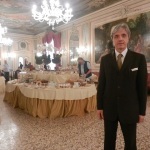 Giovanni, the efficient maître d’, made certain that all the servers and waiters attended to the needs of the guests. There was no question that this was Venice, since sparking prosecco was served along with selections of water, coffees, and juices. With soft sounds of familiar songs like Somewhere over the Rainbow and What a Wonderful Life playing in the background, I took my time to savor this experience. 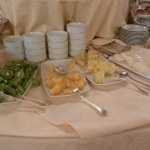 The selection was incredible, with a large variety of breads and rolls, more than ten types of pastries, fresh fruits, yogurt, cereals, prosciutto, mortadella, salami, eggs, ricotta and baby mozzarella formaggio. 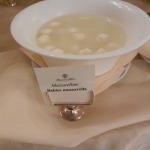 I am sure I have missed something, but the Baglioni Hotel Luna certainly did not. I could have stayed here all morning enjoying the pleasant ambience. 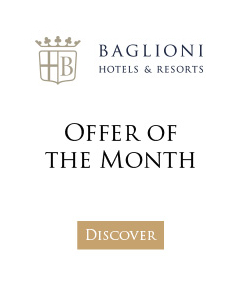 With a stay at a Baglioni Hotel this sumptuous morning feast is included at no additional charge with their Breakfast Inclusive special offer. 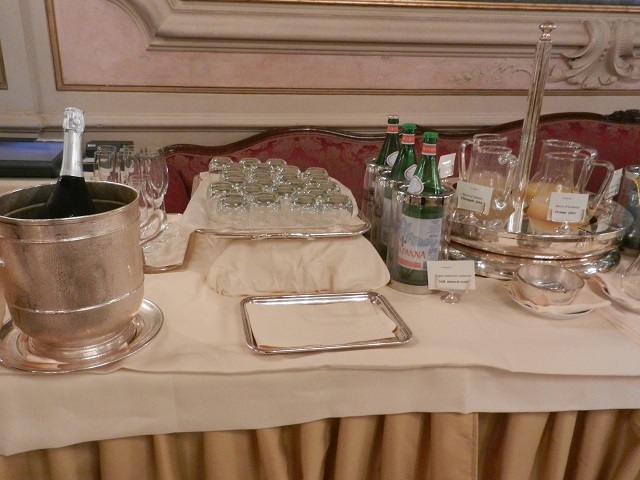 Grazie mille, Baglioni Hotel Luna for providing me with this unforgettable experience. 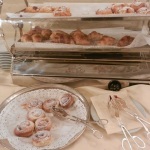 Margie Miklas is an American writer with a passion for Italy. She writes the blog, margieinitaly. Follow her on Twitter, FaceBook and Pinterest. She is the author of the award-winning book, Memoirs of a Solo Traveler – My Love Affair with Italy and the recently published My Love Affair with Sicily. 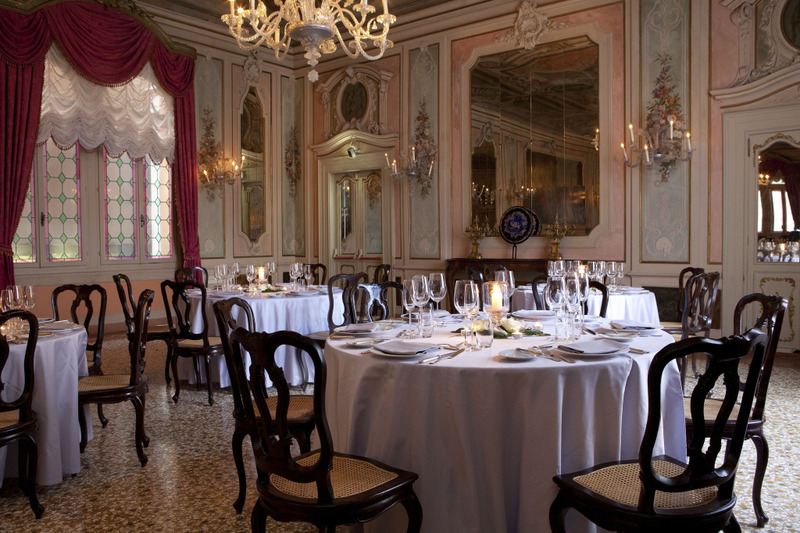 Concierge tip: Why not spend an unforgettable New Year’s Eve in Venice this year hosted by Baglioni Hotel Luna? 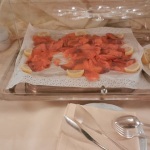 The deal includes a welcome drink, gala dinner, New Year’s Day buffet and more. 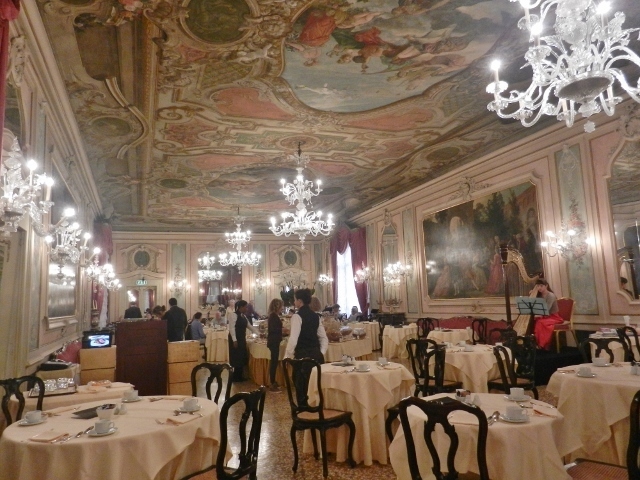 The Luna Hotel Baglioni is the oldest hotel in Venice. 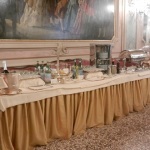 It dates back to the 12th century and is just a short distance from St Mark’s Square and the Doge's Palace.